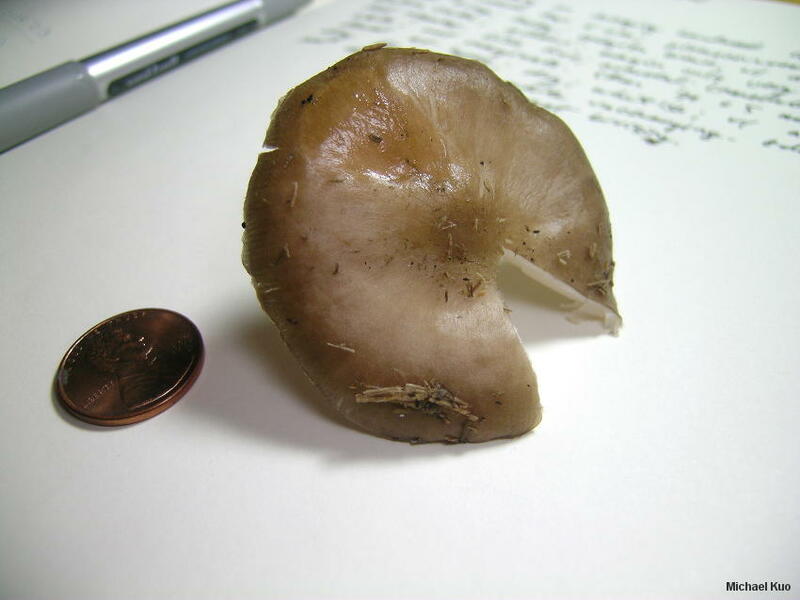 Pluteus cervinus, often called the "deer mushroom" in field guides, is widely distributed and common in much of North America--especially in temperate regions. 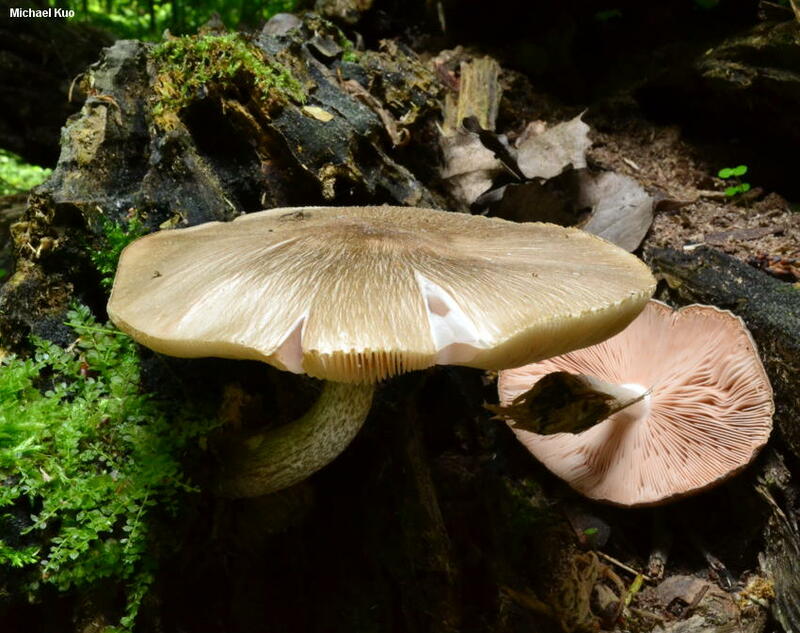 It appears on deadwood, and features gills that are free from the stem. The gills are whitish at first, but soon become pink. 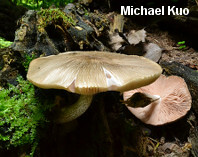 The cap is variable in color, but is usually a shade of brown. 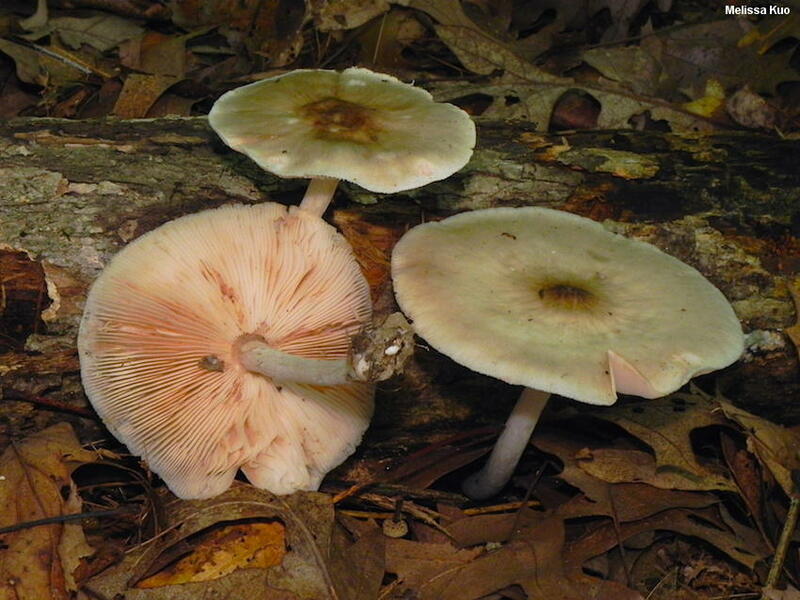 Pluteus cervinus usually appears on the wood of hardwoods, but it is not very picky about what kind of wood it grows on--nor is it very picky about when it will fruit, appearing from spring to fall and even in winter in warmer climates. Range. 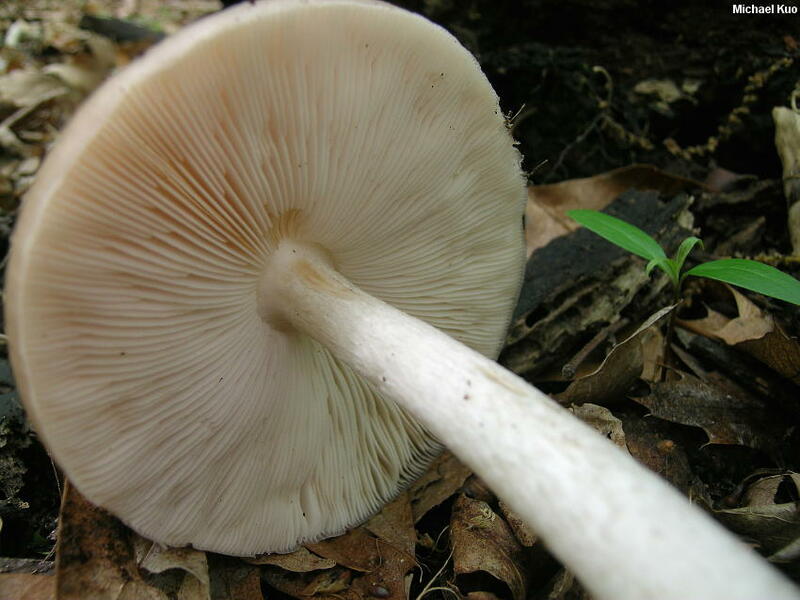 Pluteus cervinus appears to be common from the Great Plains eastward, in temperate forests (south of about the 45th parallel). In boreal and transitional forests it appears to be replaced by Pluteus rangifer. 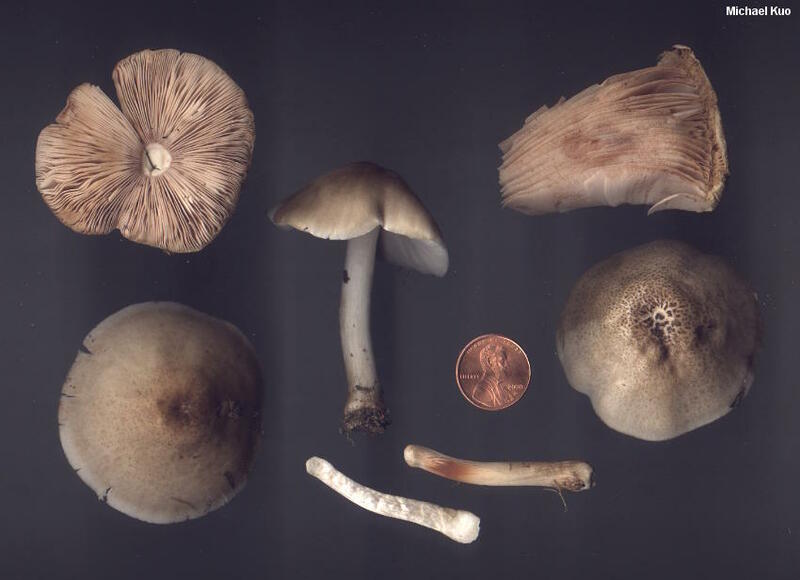 It has also been verified from the San Francisco Bay area, but it is not common there, and Pluteus exilis is more common on the West Coast. The common species in the Rocky Mountains awaits DNA identification. Habitat. Pluteus cervinus is usually a woodland species, and is not generally found on woodchips in urban areas; Pluteus petasatus is the common and widespread woodchip species. Macromorphology. 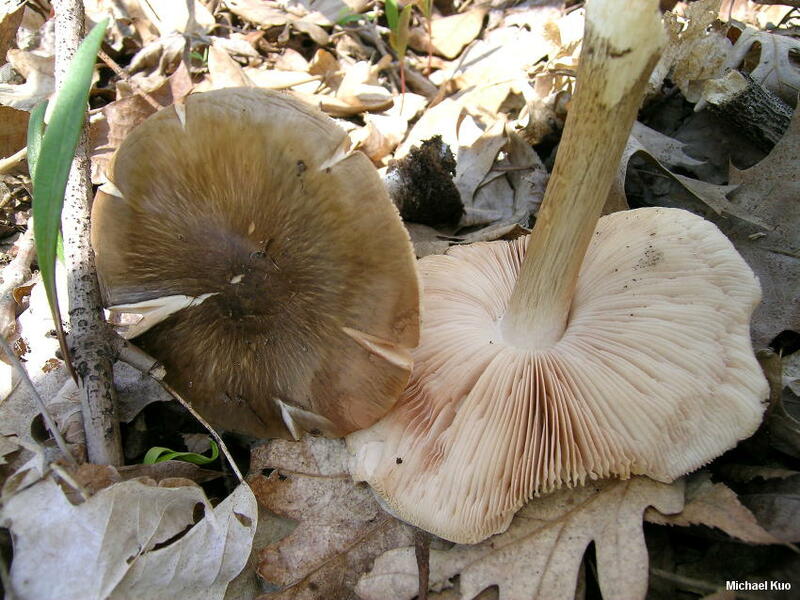 Both Pluteus rangifer and Pluteus exilis usually (but not always) feature darker brown caps, and stems that are more scaly with brown scales and fibrils than the stems of Pluteus cervinus, while the cap of Pluteus petasatus is usually (but not always) paler. Micromorphology. Pluteus cervinus lacks clamp connections in the pileipellis; several look-alikes have clamps. 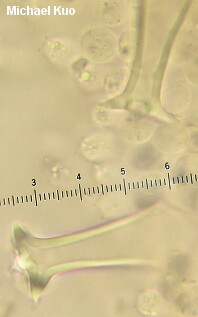 Pluteus cervinus has pleurocystidia with entire (rather than branched or bifurcated) hooks or "antlers," its "intermediate cystidia" (immature pleurocystidia) are not consistently fusiform (like those of Pluteus petasatus and Pluteus rangifer), and its cheilocystidia are frequent and form a consistent strip along the edge of the gill. 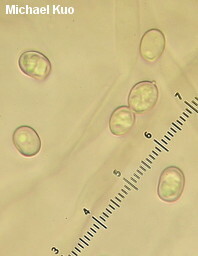 The spores of Pluteus cervinus are usually about 5-6 µ wide (Pluteus petasatus has slightly more narrow spores). If all of this frustrates you, and you would rather just call your collection "Pluteus cervinus" like you always have, and have done with it . . . well, I can't say I blame you. But if you do so, remember that psychology, rather than biology, informed your decision. And anyway, if you like studying mushrooms, figuring this stuff out is fun! I have just spent many pleasant hours going through ten cervinus-like collections I have made over the past 20 years, carefully assessing all of the micromorphological features mentioned above. One of my collections, it turns out, was actually Pluteus petasatus with a darker-than-average cap--and the other nine were all matches for Pluteus cervinus, despite fairly large differences in cap color. However, all my collections were from Illinois, where cervinus is the common species. I will now have to make an effort to make cervinus-like collections in western and northern North America! Pluteus atricapillus is a synonym. Ecology: Saprobic on the deadwood of hardwoods and, less often, conifers; occasionally appearing terrestrial but actually arising from buried deadwood; growing alone, scattered, or gregariously; spring through fall; common in eastern North America from about the 45th parallel southwards; also recorded from the San Francisco Bay area. The illustrated and described collections are from Illinois. Cap: 4.5-10 cm; convex at first, becoming broadly convex to nearly flat, with or without a broad central bump; tacky when fresh, but soon dry, or slightly sticky when wet; shiny; bald, or finely scaly/fibrillose over the center; often radially streaked; dark to pale brown, often with a hint of olive or gray--or occasionally nearly whitish, with a brown to brownish center; the margin usually not lined, but sometimes faintly lined in older, diminutive specimens. Gills: Free from the stem; close or crowded; short-gills frequent; white at first, becoming pink and eventually becoming deep flesh color. 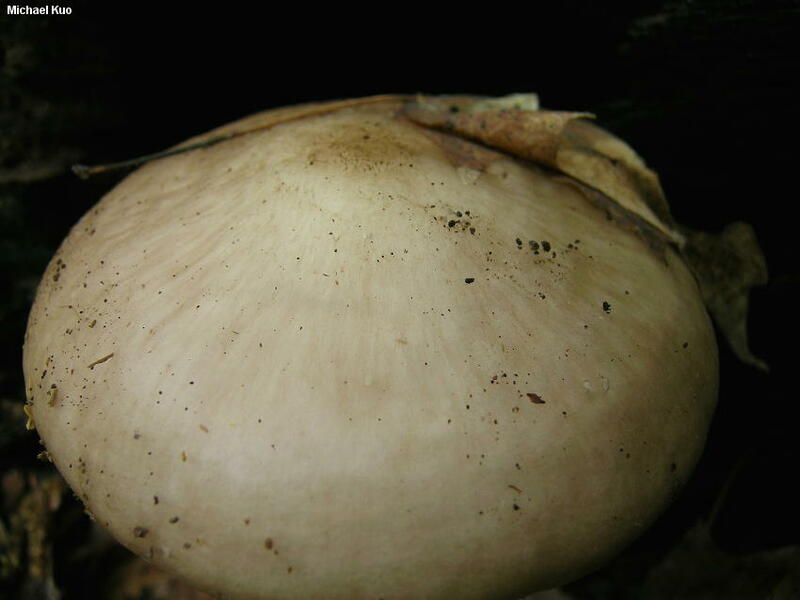 Stem: 5-13 cm long; 5-15 mm thick; more or less equal, or with an enlarged base; dry; bald or, more often, finely fibrillose with brownish fibrils; whitish, discoloring brownish near the base; basal mycelium white. Flesh: Soft; white; unchanging when sliced. Odor and Taste: Odor not distinctive, or somewhat radishlike; taste usually at least slightly radishlike. Chemical Reactions: KOH negative to very pale orange on cap surface. Microscopic Features: Spores 6-8 x 4.5-6 µ; ellipsoid; smooth; hyaline to faintly ochraceous in KOH; uni- to multiguttulate; inamyloid. 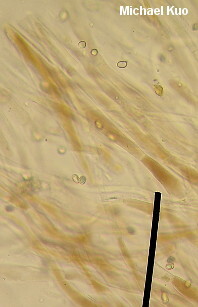 Cheilocystidia abundant (though often collapsing); forming a more or less continuous strip; to 50 x 15 µ; clavate to sphaeropedunculate; hyaline; thin-walled. 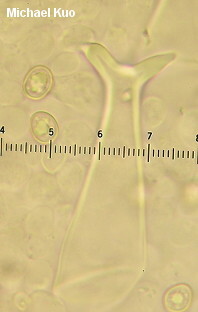 Pleurocystidia 50-90 x 10-25 µ; fusiform to widely fusiform or narrowly utriform; thick-walled; hyaline; with 2-5 apical prongs or hooks; prongs usually entire rather than bifurcated, rarely branched. 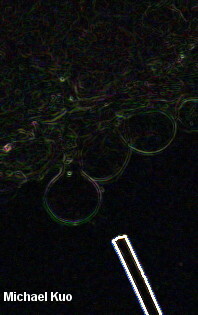 Intermediate cystidia variously shaped. Pileipellis a cutis or ixocutis; elements 3-11 µ wide, hyaline to brown in KOH, smooth; terminal cells clavate to subclavate or cylindric; clamp connections absent. REFERENCES: (Schaeffer, 1774) Kummer, 1871. (Saccardo, 1887; Kauffman, 1918; Smith, 1949; Singer, 1956; Smith, Smith & Weber, 1979; Weber & Smith, 1985; Arora, 1986; Vellinga, 1990; Phillips, 1991/2005; Lincoff, 1992; Metzler & Metzler, 1992; Horn, Kay & Abel, 1993; Banerjee & Sundberg, 1995; Barron, 1999; Roody, 2003; McNeil, 2006; Miller & Miller, 2006; Kuo, 2007; Binion et al., 2008; Trudell & Ammirati, 2008; Justo et al., 2011a; Justo et al., 2011b; Justo et al., 2014; Kuo & Methven, 2014; Evenson, 2015.) Herb. Kuo 04289501, 06160204, 04290301, 05010304, 05020603, 04200701, 08241406, 05311501, 05311502.